I use a Galaxy Nexus as my main phone and the Transformer Prime is my main tablet, so I spend a substantial amount of time using stock ICS. I can say one thing without question - it is the experience that I wish for every Android user. It's so good - if you haven't had the opportunity to use it, swing by the local Verizon and mess with the Nexus for a few minutes - you'll see what I'm talking about. The UI is amazing, Roboto is absolutely gorgeous, and the Holo theme is undeniably elegant and smooth. It's not just about the look, either; the ICS keyboard is unbelievable, the stock launcher is the best that Android has ever seen, the lockscreen is clean and useful, notification dismissal is drastically improved over previous versions - I could easily go on and on. It's just that good. And then HTC got a hold of this beautiful thing and put Sense on it. If you haven't already, just watch the above video. Within seconds it's clear that HTC has little clue what users really want. Everyone has been waiting for ICS, and we've all talked up the use of on-screen navigation buttons for months, but what does HTC do? Gives this new handset capacitive keys. For the sake of objectivity, though, we'll let that design choice slide. This is about the software after all. As soon as the device is unlocked, what do we see? HTC's attempt at a new launcher. It's good to see that they gave Rosie a facelift, but it still looks so... old. Actually, it reminds me of the now-outdated Launcher Pro. The guy (assuming it's a guy - if it happens to be a female with manly hands, I apologize now) swipes through a few pages in the app tray while we watch the launcher struggle to keep up with his thumb. Has this ever happened on my Nexus? I can't say that it has. I understand that this is alpha - or at the very latest, beta - software, but let's put it this way: If I were a betting man, I wouldn't be putting my money on HTC fixing it. Then comes the settings menu. 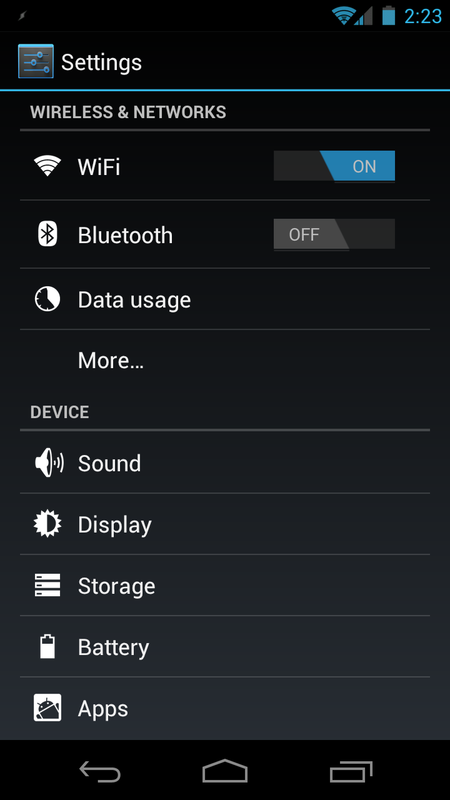 Have you seen the ICS settings menu? It looks fantastic. Look at the ICS screenshot, then go check the 1:10 mark in the Ville video. I will give HTC some credit here - that window blinds-esque transition animation is pretty sweet. But it's not sweet enough to make up for what follows: the white menu. Seriously? Froyo (and it's predecessors), despite its ugly white notification bar, still had a much sleeker black menu (as did previous Sense phones). 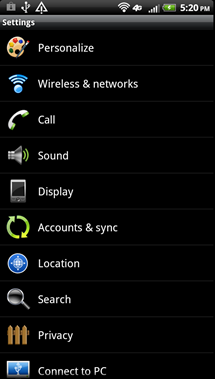 Combine the Sense 4 menu with those huge colorful icons, and it looks like a Playskool toy. Then there's some more lag. From there, the rest of the video is basically just the guy flipping through the menus, showing us the version information (twice), and so-on and so-forth. I understand that Sense is HTC's big brand association feature, and that it's one of the main things that ties the company to its customers. For example, I spoke with a good friend of mine this morning who told me he just bought the Rezound. When I asked why, he told me that he liked the familiar interface from his previous phone (Droid Incredible). Basically, he's comfortable using Sense. Because of this kind of brand loyalty, I can see why HTC is reluctant to shed any of its skin to make way for stock parts of Android. However, if you take a look at HTC's recent Windows Phone offerings you'll notice one thing - Sense is nowhere to be found. They all provide the stock Windows Phone experience. Why is that? Microsoft doesn't let them. But HTC makes Windows phones, anyway, Sense be damned. So, why single out Sense instead of TouchWiz or Blur on ICS? Because, using current leaks as the reference, TouchWiz and Blur still allow elements of ICS to shine through (for now, at least). Sense 4? No way. It's overbearing. It's in-your-face. It's at every turn, every tap of the menu, every swipe to a new screen. Homescreens, app tray, settings menus, widgets - they are all Sense. Like I said, the only thing ICS about this is the Roboto font. I'm not even sure I want to acknowledge Sense handsets as real Android 4.0 phones. They're Sense 4 phones. This isn't brand-hate, either. Before my Galaxy Nexus, I had an HTC Droid Incredible, and I loved it. Actually, I still love it. 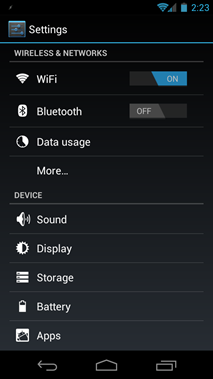 I used stock Sense UI for the first several weeks of owning the phone and custom Sense ROMs for many months after. The majority of the time, though, it was running CyanogenMod 7 with GoLauncher themed to look like the Sense launcher. So, no, I don't hate Sense. I actually like Sense and find it very useful. In fact, I don't hate most custom UIs. I think they provide individuality to Android. Each manufacturer gets its own way to makes its handsets unique, and I fully support the diversity (as long as it doesn't sacrifice performance, that is). What I do hate, however, is that some manufacturers (HTC, in this case) are getting more aggressive with their skins. Google spent a substantial amount of time making ICS look and feel good, and when a custom skin overrides all the work that was done to make Android what it is today, it's insulting to the devs who put forth all the effort required to make something that not only looks amazing, but works amazingly, too. Think of it this way: how would you feel if you were an architect, and you designed a blueprint for a house and took the time to pay attention to every single detail, ensuring that everything looked great, then made it available for everyone to use. Then I came along, used your blueprints to build that house somewhere, only to cover every last inch in green and pink polka-dots and zebra print. Wouldn't you be a little bit insulted that I ruined what you worked so hard on, even if it's technically mine to do what I want with? Your name is on those blueprints. And how do you think that every person who had to live in (or even look at) that house afterwards would feel? But, what if I only painted one room with zebra print? That would be much more tolerable; in fact, some people may even like that. While that example may be a bit extreme (Sense isn't that much of an eyesore, right? ), the point is still the same. Manufacturers, create your custom UIs, but know that more isn't always better - you don't have to skin every last menu. It's okay to let some of Android's natural beauty shine through.